Are you ready yet? 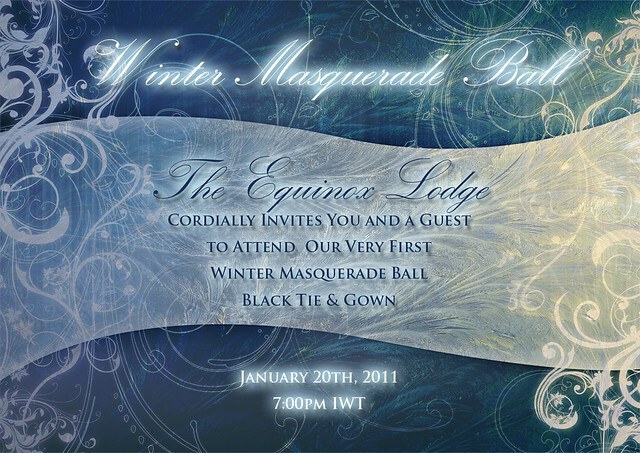 Equinox will be opening it's doors to welcome you to their very first Winter Masquerade Ball on Thursday, January 20th at 7:00pm (IWT). Lucky us that have had all this extra time to search for the perfect gown or tux for the ball at Equinox. And hair, and makeup and skin, oh and shoes, and masks, oh my! All this shopping would be exhausting, if it were not so much fun. In a flurry of dashing about the grid today, I managed to swing by M!raMode at Bellissima Square and saw that her latest group gift for January is there. Oh Joy! When I read her blog about the Plume gown, I knew I had to have it. Something alluring about the way the feathers brush the floor softly as I move, and the mysterious glamour of it all. I love it! It's far more glamorous than I had imagined and I simply adore the details on the bodice and the feather accents on the chest. The opera length gloves are beautiful! I have paired the gown with the lovely white feather mask from Rahja Designs, and the glowing beautiful skin is indeed the latest Ethereal skin in Latte by Paparazzi, freshly arrived in her store today. The make-up layers for this skin will be coming soon, but the skin alone is so beautiful! I'm waiting for you... Come Dance with Me! ooo a new paparazzi skin... im so tempted.